This 1896 home was designed by architect Alfred Hoyt Granger for John Hartness Brown, a wealthy real estate developer who lost control of the house in 1908, but continued to live there. Brown is credited with the conception of University Circle and an early planner for the development of Cleveland Heights. In 1910, he was an important witness and possibly a suspect in the inquest following the unsolved murder of William Rice. In 1914, he left Cleveland Heights “under a cloud” and moved to London, England. 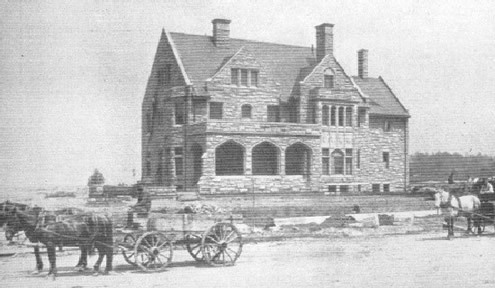 John Hartness Brown House under construction, c., 1896. The exterior of this “Tudor Eclectic” style home features a broken-course sandstone with rose colored mortar, ground floor buttresses, Tudor style doorways and windows, and a second-story bay window of copper, decorated with shields. Gothic detailing is found on many of the doorways in the form of geometric tracery. The airy and light-filled interior of the house is in surprising contrast to the somber, rather forbidding exterior. The woodwork is particularly fine and is noted for its depth of color, degree of finish, variety of species and fine state of preservation. Many of the ceilings are beamed and some are carved with trefoils and tracery. All hardware in the house is of a whimsical Gothic nature. Special features of the home include two pantries and a large “cooler room”, a conservatory, original tapestry wall covering in the dining room and elegant mahogany staircase.